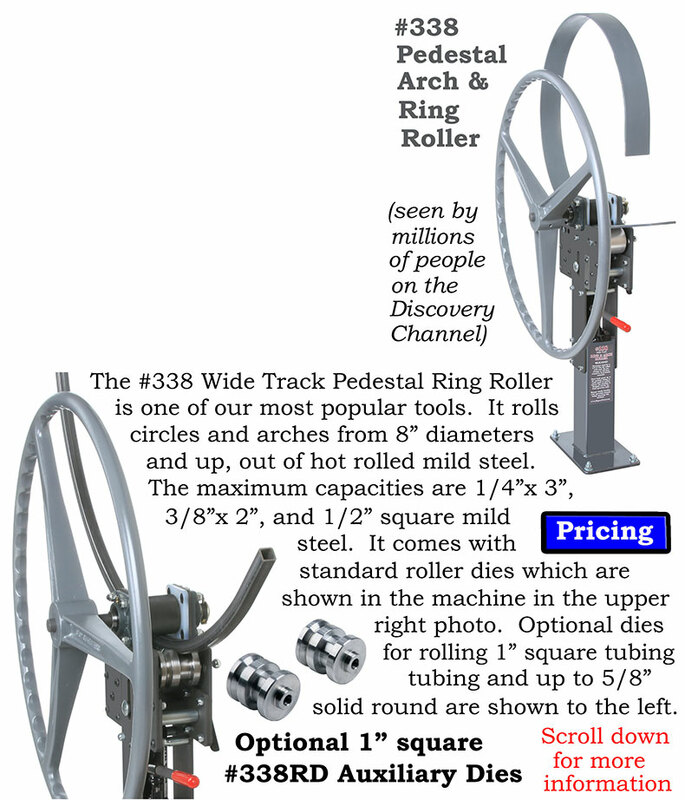 The #338 Wide Track Pedestal Arch and Ring Roller is one of the handiest tools you can have in your shop. It’s hard to beat this handy pedestal roller for rolling and forming arches and rings out of solid square and flat within the capacities that are specified above. Optional Auxiliary Dies are also available for rolling 1” square tubing and up to 5/8” round into circles or arches. Examples of items that can be rolled can be seen by clicking on the Fabricated Projects button in the right column. The large drive hand wheel is made out of a durable aluminum alloy. It has hand grips on the inside of the wheel that makes using it as the driver for driving the material through the forming rollers real handy. If you have an old man-killer hand crank rollers (manufacturer not known) that’s still out there in a few shops you will appreciate using the #338 with its handy drive wheel shown above as part of the machine. 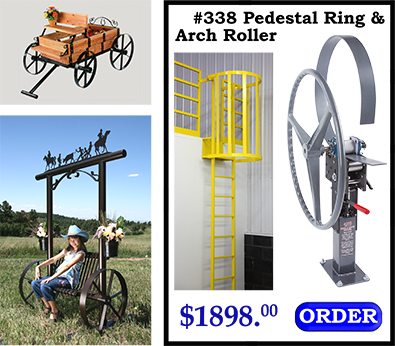 The #338 Pedestal Arch and Ring Roller is an improved version of the one that was used on the television show called Orange County Choppers. It ran on the Discovery Channel for several seasons. The guys on that show were very creative at figuring out things they could form in our roller that even surprised us. Customers are always telling us things they have formed in the #338 with special dies they’ve made for some other application outside of its original intended use. If your looking for a smaller roller for rolling small rings out up to 3/16”x 1-1/2” flat, 1/4”x1/4” flat, 3/8” square, and 5/16” round, check out our #1415 Bench Mount Planetary Ring Roller.